You have a website for your real estate business. The primary reason you probably have a website is to generate leads, right? Most home buyers use the internet during their home search process, so having a website is critical. Unfortunately, your website is not the “Field of Dreams”. If you build it, leads probably won’t come. Not unless you do something to let them come. There are ways to get a lot of traffic (aka leads visiting your website). Ideally, your website has a regularly maintained blog as your content marketing strategy. And to drive more traffic to your website, you would purchase ads on Google AdWords or Facebook ads. But here’s the catch: A good content marketing strategy takes time to generate traffic, purely by the way that the search engines treat them. And most Realtors (and any small business owner) are apprehensive about buying online advertising. Even if the Realtor was ready to purchase advertising, it really takes an understanding of how to do it most effectively such that it would be beneficial to pay for a service to manage your advertising strategy for you. Content marketing is a long term strategy. And there are simple strategies you can do before you pay for advertising. Fortunately for you, there are strategies to generate traffic to your website that don’t require a significant investment in time and money. You can accomplish everything on this list before you go out for lunch. Include a link to your website in your profile of all of your social media accounts. These include your Twitter, Facebook, Google+, Instagram, Pinterest, LinkedIn, and any other accounts you use for your real estate business. Once you update your profile, most social media sites will notify your connections. Why do this? You likely have many connections in your social media. So people following you on social media need to know how to find your amazing website. Another social media strategy is to make a post or a tweet advertising that you have a website. Why do this? This post will be at the top of your social media page and a post makes it very easy for your connections to share, retweet, like, etc. Update your Zillow profile to include a link to your website. Likewise, update your Trulia, Realtor, and any other real estate oriented website that you have a profile. Why do this? Visitors to these sites who see your profile are either looking for a property or a Realtor. They should be able to find your contact information, and be able to get to your website to learn more about you and your services. Put a link to your website on your profile on your brokerage website. This is where people find you under the “Agents” page. Why do this? Although your profile on your brokerage website doesn’t likely get many visits, you will definitely stand out from all of the Realtors at your brokerage that don’t have a personal website on their profile. Put your website address on your business cards. Ok, so ordering new business cards isn’t free, but it is a very minor cost, and we suspect you are almost ready to get new cards anyway. Why do this? Your business card is a mini advertisement for you with your contact information. These also get distributed for referrals. Make it easy for referrals to get value from your website and learn about you. Put a link to your website in your signature line on every email you send out. You also should have all of your social media links on your email signature as well. Why do this? You want to make it as easy as possible for the people you email to go to your website (and social media too). Links in emails are clickable, making is extremely easy for people to get to your website. Email your entire database to let them know you have a website. Ask them to go to your website and request their feedback. Ask them to forward the email with your website to anyone who may need a Realtor when you ask for referrals. Why do this? This is probably the most important point on this list. Almost any reason to email your database is a good reason. And this email will help get the word out about your website faster than any other method. Everybody uses email. Forwarding an email is easy for your clients to do, and they are more likely to forward it if you ask them to. This very simple strategy advertises your website everywhere your name is to everyone on your list. You want to make it easy for people to get to your website and following these 7 easy steps will get leads there. You should write in your blog as well, and maybe consider paid advertising at some point. 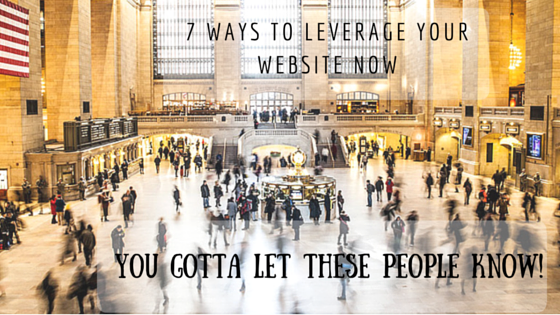 But the 7 steps we listed is a great start to getting the word out about your website.